Kevin Youkilis Hits for Kids is a charitable organization founded by Boston Red Sox infielder Kevin Youkilis, dedicated to rallying local and corporate support for charities and organizations focused on the health and wellbeing of children. 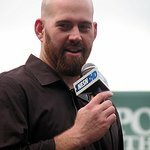 Kevin Youkilis Hits for Kids teams up with existing community-based children’s charities and medical research programs in New England and in Kevin’s home town of Cincinnati, to help them raise money and awareness. Google trends for "Kevin Youkilis Hits For Kids"
We don't have any videos related to Kevin Youkilis Hits For Kids.